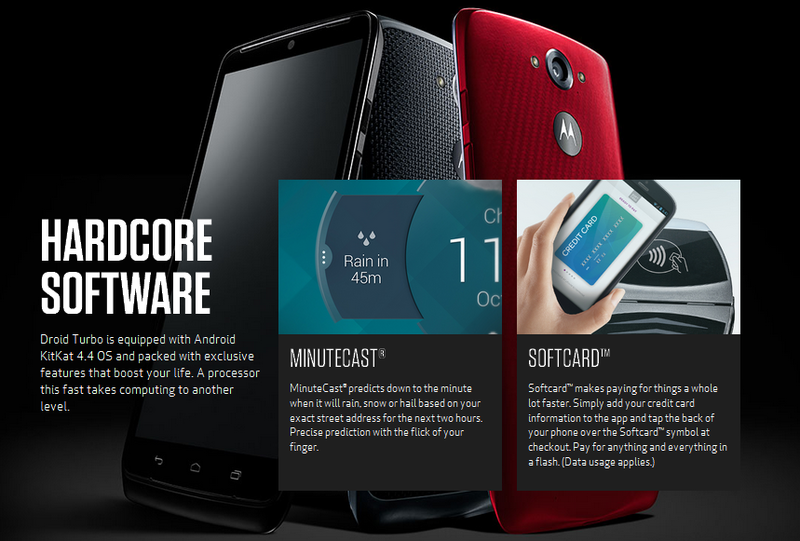 The specs sheet already has stunned with its 5.2-inch quad-HD screen, 21-megapixel camera, Snapdragon 805 chip, and a 3900 mAh battery.the DROID Turbo is available in two bodied options: metalized glass fiber (MGF) and nylon fiber,However, it’s not water resistant,the DROID Turbo impresses with its 5.2-inch quad-HD 2560 x 1440 AMOLED display giving it that future proof quality with a killer pixel density count of 565 ppi.the software running in the DROID Turbo is running pretty much the same mostly stock Android 4.4.4 KitKat experience we’ve seen already in the latest Moto X smartphone in particular and Motorola says that it will be upgraded to Android 5.0 Lollipop after that is released, the listing includes Moto Voice, Moto Actions, Moto Assist, and Moto Display. 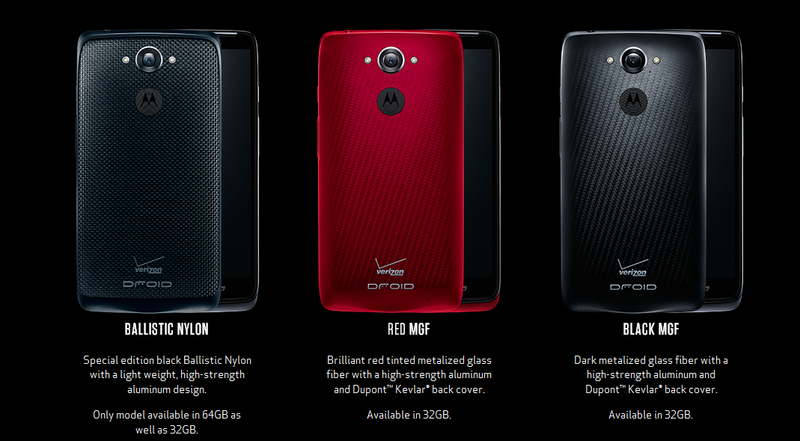 Honestly speaking this phone is built like a tank like a whooping beast everyone was expecting Nexus 6 would have been,nevertheless i guess they might be thinking to revamp the droid line since few years before Motorola DROID popularized Android to new heights bringing them into the game ! Interestingly, though, it bears its own set of software features different form the Moto X, that gear to sharing content between other sevices. Going with the “Zap” tagline, these features seem to be more social, where handset owners share content between one another.It's actually a standalone app, which can be downloaded on other Android phones. For starters, there’s “Zap Zone,” which automates sharing between friends by creating a “zap zone” – where invitees to the zone can share photos within the group with the flick of a finger. The processor in the DROID Turbo is Qualcomm’s latest quad-core Qualcomm Snapdragon 805 SoC clocked at 2.7ghz with a beefy 3GB of RAM with Adreno 420 GPU.It is based on 64-bit architecture.But lacks expandable memory via microSD card slot but you have an on board memory of 32/64gb. Speaking about camera it packs along an impressive 21-megapixel auto-focus camera, which features an f/2.0 aperture lens, dual-LED flash same seen in nexus 6 and Moto X(2014) just built in a different fashion, and up to 4K video recording. 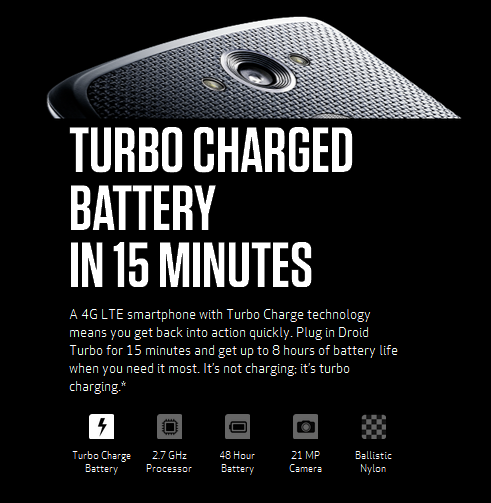 Motorola is also including the Turbo Charger with the Droid Turbo, which offers 8 hours of battery life on just 15 minutes of charging. The only disappointment so far is off screen button are there :P :( This phone has been launch with verizon (Carrier partner) maybe we'l get a phone off contract to soon..